This mid back leather office chair is part of the new executive "Sharp" collection from OFM a series of office chairs that include a high back, mid back and guest chair. Each chair easily coordinates with today's traditional or contemporary office decors. Features include top grain leather upholstery, waterfall seat edge that helps to promote circulation to the legs, 4" of foam padding on the seat cushion for all day comfort, plush pillow top style cushions, knee tilt control mechanism for a more relaxed recline, tilt lock with adjustable tilt tension control, one touch pneumatic seat height adjustment, leather padded polished aluminum arms and a heavy duty polished aluminum base with dual wheel casters. 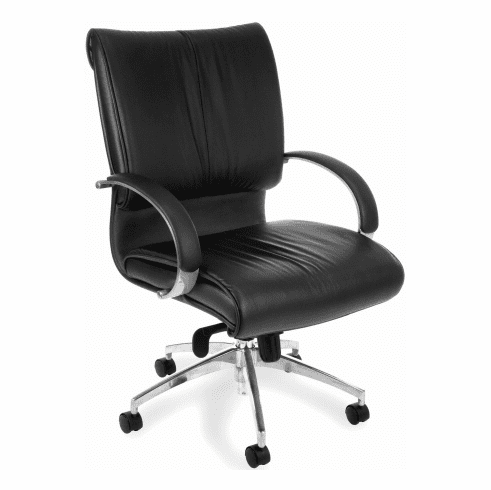 This leather office chair meets or exceeds ANSI/BIFMA standards. Dimensions: Seat Size: 21"W x 21"D. Back Size: 21"W x 22.5"H. Seat Height Adjustment: 17 -21"H. Overall: 40 -44"H x 25.5"W x 25.5"D. Limited lifetime warranty from OFM. Normally ships in 1-2 business days from our NC or AZ warehouse.